Matthew’s Gospel guides us into the events that follow Joseph’s and Mary’s visit to the Jerusalem temple. During the six weeks between Jesus’ birth and Mary’s sacrifice in the temple, Joseph seems to have secured needed housing for his young family, perhaps through family members. For Matthew writes of “the house” (Matthew 2:11). From this point, it seems that Mary and Joseph settle into a rhythm in Bethlehem. Joseph likely plies his considerable skills as an “artisan” who works with wood, stone, and metal in the ongoing temple renovations. This is the proper understanding of the Greek term tektōn which is translated “carpenter” in Matthew 13:55. How long this little family stays in Bethlehem, we cannot say. The only definite time marker that we possess is the notice “from two years old and under” (Matthew 2:16). Hence, it appears that Jesus is at least a year old, perhaps a few months older, when Herod receives the “wise men from the east” (Matthew 2:1). We know almost nothing about these men, of whom Luke says nothing, and how long they have been traveling. Legend has tried to fill in the picture, with little success. We do know that they bear gifts at home in Arabia, “gold, and frankincense and myrrh” (Matthew 2:11). But these items are available in most sizeable Near Eastern markets of the day. The wise men likely find King Herod in his huge palace whose ruins currently lie south and east of Bethlehem. From there, they need only travel three miles or fewer to where Joseph and Mary reside. The arrival of the wise men causes panic in the royal house. Herod hastily assembles “the chief priests and scribes” from Jerusalem, a good eight miles away, and demands to know “where Christ should be born” (Matthew 2:4). When the wise men do not return to the palace with news of the child, and the King judges that they have avoided him, he then issues the infamous order that his soldiers slay “all the children that were in Bethlehem” (Matthew 2:16). Even though some scholars plead that Herod would not turn on these children, his act fits menacingly with his irascible personality. After all, he had his favorite wife and several sons executed. And a lot of others whom he suspected of treachery in one form or another. When does the slaughter of the children happen? Contemporary ancient accounts tell us that Herod dies in the spring of 4 B.C., before Passover that year. During the last months of life, he suffers terribly from a lingering, debilitating disease that Josephus describes in detail. Presumably, it is in these months that Herod issues his directive against the children, hoping to catch The Child in his deadly net. After all, he is already on edge because of rebellious acts and public insolence as news of his disease spreads among the populace whom he has ruled so ruthlessly. God’s eyes, of course, have been on the little boy Jesus and his parents. To protect him and them, God sends an angel who appears “in a dream” to Joseph, “saying, Arise, and take the young child and his mother, and flee into Egypt.” Immediately, Joseph “arose, [and] he took the young child and his mother by night, and departed into Egypt.” Joseph knows not to delay, for part of the angel’s message is that “Herod will seek the young child to destroy him” (Matthew 2:13–14). The most direct route takes a traveler through the desert of the northern Sinai and into the fertile Egyptian delta. The tradition of the Coptic Orthodox Church of Egypt holds that the “Holy Family,” consisting of Mary, Joseph, and Jesus, remains in Egypt for just over three and a half years, moving from place to place, beginning in the delta and western desert, and traveling and stopping all the way to Upper Egypt in the south of the country. Whether the family moves as often as tradition says is impossible to determine. But for Egyptian Christians, Jesus’ presence on their soil makes their land “holy.” The notion that Joseph and his little family stay in Egypt for an extended period receives support from Matthew’s account. He writes that when “an angel of the Lord appeareth in a dream to Joseph in Egypt,” he brings news that “they are dead which sought the young child’s life” (Matthew 2:19–20). The plural “they” in the angel’s words points to a conspiracy against the child Jesus that is broader than the King himself. To be sure, he is the instigator. But he is not the only one who will be threatened by the rise of a new ruler. If the danger to Jesus comes only from Herod, God can have sent his angel a few months after their arrival in Egypt, following Herod’s death. Instead, God waits until all of the conspirators are dead before sending Joseph and his family back. 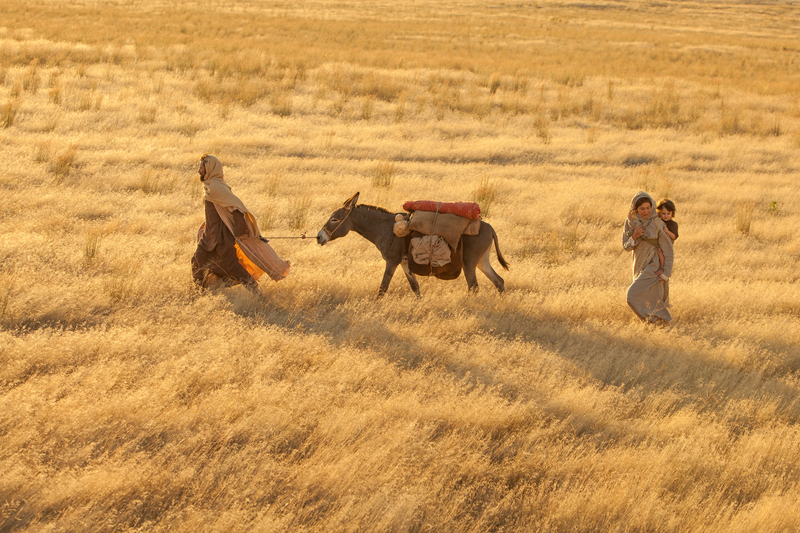 Upon their return, another dream warns Joseph to take his family to Galilee, settling in Nazareth (Matthew 2:22–23). Here Joseph can use his skills in the rebuilding of the prominent city of Sepphoris, just three miles over the hill north of Nazareth. The people of this city rebelled when Herod died and paid a huge price when a Roman army from Damascus arrived and crushed the rebellion, burning the city. It is likely that Joseph goes to work here, taking the youthful Jesus with him as soon as he is old enough to engage in hard manual labor. The later conversation between Jesus and Pilate illustrates the probability that Jesus accompanies his father. How so? Because in no account is an interpreter said to stand between Pilate, an educated Roman who speaks Greek, and Jesus the man from Nazareth. Most of the foremen who are supervising the rebuilding work in Sepphoris during Jesus’ youth are Greek speakers. Jesus will quickly pick up the language so that he can communicate with them. The effect is to make Jesus quadri-lingual in his youth. He speaks Aramaic in his home, he learns spoken Egyptian playing with other children during the years in Egypt, he learns Hebrew from scripture studies, and he picks up Greek while working alongside his father.